Dreyer's film charts the final days of Joan of Arc as she undergoes the degradation that accompanies her trial for charges of heresy – through her imprisonment and execution at the stake. 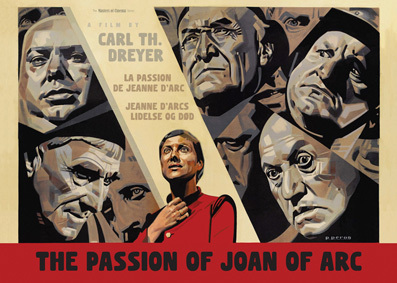 Recently voted one of the Top 10 Greatest Films of All-Time by Sight & Sound magazine, The Passion of Joan of Arc will get its worldwide Blu-ray première by Eureka as part of the Masters of Cinema series in an exclusive new restoration presented in both 20fps and 24fps playback speeds, and featuring Dreyer's own original Danish-language intertitles. It will be available in THREE formats – Blu-ray, DVD, and Ltd Edition Dual Format (DVD & Blu-ray) SteelBook editions. All three will be released in the UK on 19th November 2012 at the RRP of £18.37 for the DVD, £20.42 for the Blu-ray and £30.63 for the dual format Steelbook Edition. The complete "Lo Duca" version of the film – the version (featuring an alternate edit and soundtrack) that circulated in France and around the world for decades before the rediscovery of Dreyer's "director's cut"